This entry is written by Stuart Sandin, Assistant Researcher of Marine Ecology at the Scripps Institution of Oceanography. When taking toll of the ocean, there is no organism quite as intimidating as the shark. With their sleek body plan, inquisitive behavior and, yes, sharp teeth, their presence changes the mood of all swimming nearby. It is precisely this imposing presence that underlies the importance of sharks to marine environments. Imagine being a fish in sharky waters--if you are smaller, sicker or slower than a friend nearby, then you will be the likely target of the swift strike by these apex predators. In this way, sharks serve as a critical filter by filtering out less able fish and structuring fish communities. On coral reefs with healthy shark populations, the typical prey fish is large and fit. These bigger sharks serve different roles than their smaller-bodied counterparts, eating different foods, moving larger distances, and generally "holding the fort" of reef communities. Admittedly, we don't yet know all of the roles that sharks play on coral reefs, but this is why we visit places like the Phoenix Islands. Targeted fishing of sharks from most reefs has made predator-heavy sites a rarity on the planet. However, it is imperative that we outline how coral reefs function in the presence of sharks in order to set a baseline for management of reef fisheries globally. We hope to find intact fish assemblages with lots of sharks on the other islands that we visit this trip so that we can continue to learn about the ecological role of sharks on reefs. But we also recognize that hope is not the only thing that we should do. 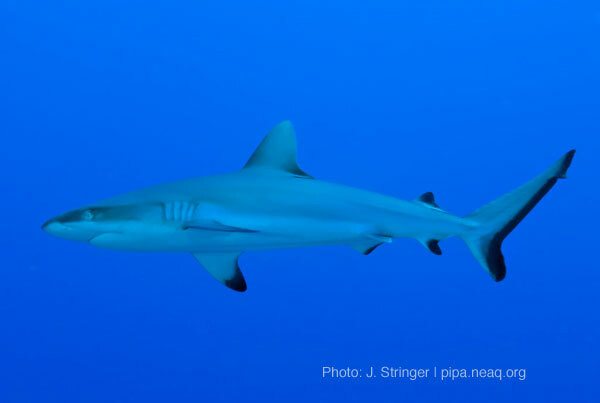 It is a priority now to assure that the fishes (especially the sharks) of marine parks like the Phoenix Islands Protected Area (PIPA) remain protected from illicit fishing activities. Keep posted for more details about this on the blog. From your observations on this cruise would you say that the key findings of the Scripps Line Islands cruises hold true in the Phoenix Islands? In particular do you see the inverted biomass pyramid when looking at apex predators versus prey fish, and do you also see a correlation between human habitation and increased coral disease? I realize that the goals of this cruise are different than the Line Islands cruises but I would be interested to know what your informed guess on these questions is.